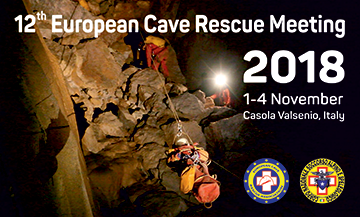 Cave Rescue Service of Slovenia (JRS) operates within the Speleological Association of Slovenia (JZS). JZS origins date back to the 19th century. Gradually, due to the need of rescuing, JRS has developed. Its official beginnings date back to 1959. Based on the “Act on the Protection against Natural and other Disasters” JRS is defined as public service for protection, rescue and relief which operates independently within the Speleological Association of Slovenia. Its mission is to perform rescue and relief operations from natural caves as well as some artificial (urban) cavities, tall buildings, ski lifts/cable cars, canyons and other inaccessible areas. In the course of years JRS has been involved in many rescue operations. The longest and most difficult was in 1990 – rescue from 1200 m depth in Črnelsko brezno when the operation lasted 10 days. In order to successfully perform tasks in accordance with »Regulation on the Organization, Equipment and Training of Protection, Rescue and Aid Forces« JRS has signed contracts with 55 rescuers, chosen from a group of over 230 trained rescuers, who carry operations throughout the territory of the Republic of Slovenia. They are organized into 7 rescue centers (Ljubljana, Postojna, Sežana, Tolmin, Kranj, Velenje and Novo mesto). JRS operations are co-financed by the Administration of the Republic of Slovenia for Civil Protection and Disaster Relief. Slovenia is the cradle of historic cave exploration and karst science. About 43 % of its surface is karst area. Though small, it has a large number of known caves (currently already numbered close to 11000) and a well-developed caving scene. Among the caves there are 6 (caves/systems) that are longer than 10 km, 2 of them even longer than 20 km. 23 caves are deeper than 500 m, 6 of them are deeper than 1000 m with the deepest one reaching 1502 m depth making it 11th deepest in the world.